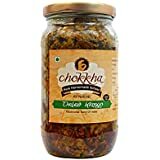 Sold by Anivarya Products (3.8 out of 5 | 9 ratings) and Fulfilled by Amazon. Gift-wrap available. 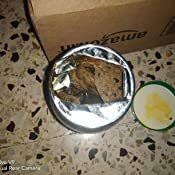 Sold by Anivarya Products and ships from Amazon Fulfillment. Ships from and sold by Delight Foods. 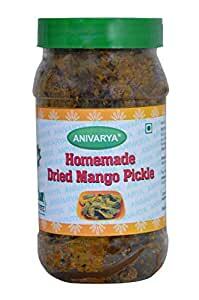 Manufacturer Anivarya Products Pvt. 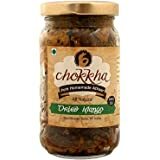 Ltd.
Mango Peel off, red chilli, turmeric, aniseed, corainder, asafoetida, cumin, fenugreek, nigella, caraway, salt & mustard oil. 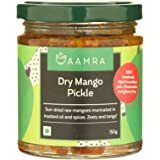 Without preservative mango dry pickle. Taste as homemade. Quantity is 350g. I very rarely like factory made pickles. The pieces are always too soft and there is a generic taste. This one is a class apart. Though you might feel it's expensive, it's worth every rupee. I can't think of anything that goes against this one! Very dry pickle and smells bad, may be they have used sesame oil.. not sure. but i didnt like the oil smell in it. The pickle is excellent. Feels like homemade. Will buy again in future. 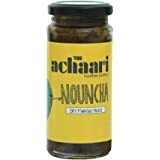 Excellent stuff, authentic home made taste, buying it again.